Lentil soup is a wonderful staple to have in the frig on cold winter days. It’s smart to make a large batch on the week end and then eat it all week. French green lentils are my favorite because they hold their shape so well! Heat the olive oil in a stockpot and sauté the carrot, celery and onion until translucent. Add the curry powder and sauté briefly to lightly toast the spices. Add the salt, vegetable stock and french green lentils. Bring to a boil and turn down the heat. Simmer for 30 minutes or until lentils are just done. Add the sweet potato and cauliflower and cook until vegetables are tender. Finish with the thyme, parsley and chives. 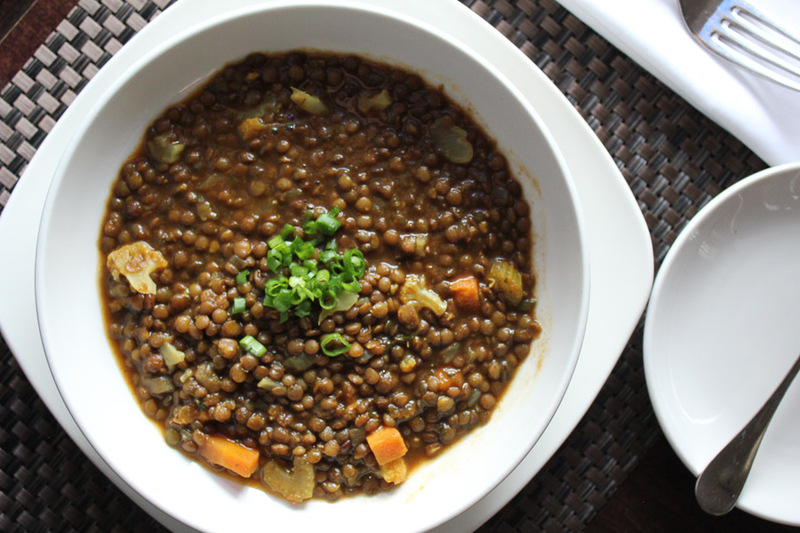 Lentil soup has always been a favorite of mine. I can’t wait to try this recipe. I just need a couple of ingredients (carrots, cauliflower) so that I can try it. I’ll definitely be making the lentil soup and the black beam burger soon. I was looking for a couple new recipes and these are perfect. Thank-you. I tried this recipe Monday and the soup came out wonderfully!! I’ve been enjoying it all week and my boyfriend loved it too! So delicious, thanks!